This post is brought to you because I'm a member of Influenster, a free-to-join community of invited trendsetters who live to give opinions of products and experiences. Basically, it's a really cool opportunity to try out new products and give honest reviews on them. I love trying out new stuff and if you do too, check out more on Influenster here. 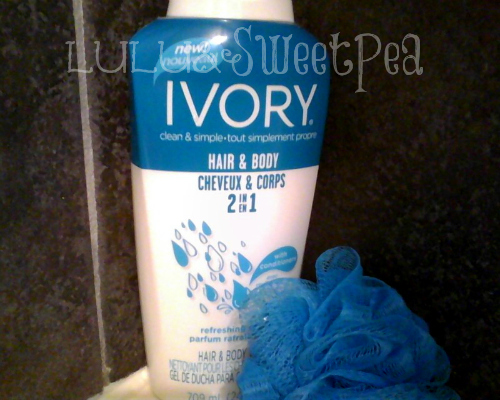 The product I got to review this time was Ivory's new 2-in1 Hair & Body wash. I have to admit, I was a little skeptical of this stuff. I have color treated hair that also has heat damage, so I decided that this product probably wasn't for my hair type. However, I found that I loved using it as a body was and to shave with. The smell is really nice and refreshing and it leaves my skin feeling soft and smooth. The rest of my family loved this product as a shampoo, my kids especially. My son exclaimed "You should buy this stuff all the time!" after using it the first time. My daughter loved the idea of using the same thing on her hair that she used to wash her body, and it left her hair very soft and smelling great. I didn't even use conditioner on her and it remained pretty tangle free. My only input to the people at Ivory is that they should make a tear-free version of this to market specifically to kids! My kids still tend to get shampoo in their eyes sometimes so that was the only complaint they had about it. All in all, I think my family enjoyed using this product a lot, and I would definitely buy it again. Thanks to Influenster for letting me try this out and for sending me some great coupons to use when I go to repurchase it. You can find Ivory 2-in-1 Hair & Body Wash at places like Walmart, Target, or Drugstore.com for $3.50. I haven't tried it on the kids yet, but I imagine it would be perfect for them (minus the tear-free part) too. I felt the same way about the kids getting it in their eyes - I was worried to let them try it!